Ocean current transport and storage could be safer and more economic and scalable than storage of carbon products on or beneath the land. 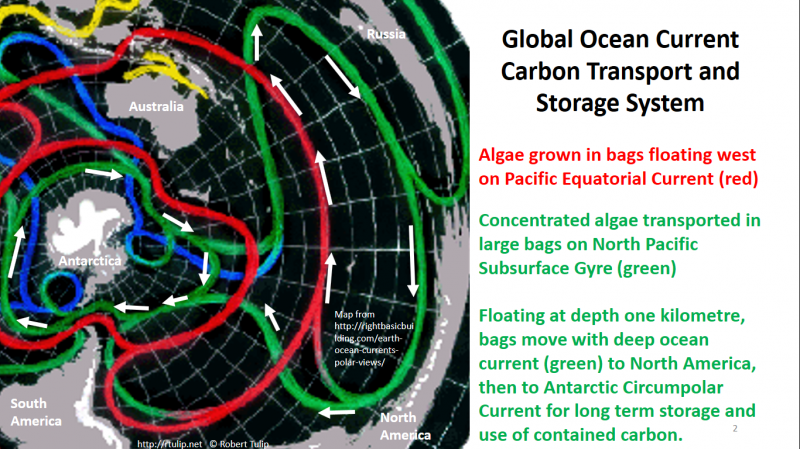 The attached diagram shows a route to move algae grown in the tropics to polar seas using deep ocean currents. The large ocean currents are the circulation system of our planet, akin to the veins and arteries of blood circulation of a body. Fossil emissions are like cholesterol in the arteries of the world ocean, potentially causing disruption of the entire system. The immediate global climate challenge is to remove more carbon from the air and sea than we add, in order to restore climate stability and insure against massive sudden change. The stable ocean currents can be used as transport and storage systems for algae, beginning at small scale to test safety and efficacy, possibly using bags containing fresh water, and building upon scientific knowledge of ocean current size and behavior [url]https://www.whoi.edu/main/topic/ocean-circulation[/url]. Growing algae in large bags in the Pacific Ocean at the equator can be a way to utilize the global ocean currents for energy, nutrient and space to contribute to climate stabilization. By sinking produced contained algae blooms to the ocean floor using tidal pumping or other methods, and applying heat and pressure, the algae can be concentrated and converted to useful commodities including oil and bioplastics. Products such as oil can then be transported in bags made of bioplastic on the deep ocean subsurface currents, if these bags can be proven to be safe and effective. There are many problems which could prevent this idea from working. It is entirely new and innovative, a research concept rather than an active proposal. The scale of the Antarctic Circumpolar Current, as the core of the stable planetary ocean circulation system combined with the other main oceans, gives potential for this method to be a major effective contribution to carbon removal, utilization and storage. Using the existing energy systems of planetary currents to mine carbon could be important to maintain the health and stability of the global ocean circulation system. The current California methane leak [url]http://www.zerohedge.com/news/2015-12-24/unstoppable-california-gas-leak-now-being-called-worst-catastrophe-bp-spill[/url] illustrates the risks of geostorage, especially where other mining occurs nearby. The whole range of storage possibilities should be explored, to find the products from algae that can best substitute for existing methods, addressing carbon capture, storage and utilization. Sequestering carbon into the ocean in stable and valuable form could mobilize the investment resources needed to scale and sustain action to deliver the Paris Leaders Agreement on Negative Emission Technology. This Planet Accord is implied in Paris Agreement [url]http://unfccc.int/resource/docs/2015/cop21/eng/l09r01.pdf[/url] Article 5 1. “Parties should take action to conserve and enhance, as appropriate, sinks and reservoirs of greenhouse gases…” The ocean is easily the largest carbon sink for the planet, dwarfing the scale of land based alternatives. Industrial systems could build carbon sinks in the ocean using algae manufacture and storage.